radiation originating in a varying electromagnetic field; for example, long and short radio waves; light, visible and invisible; x-radiation and gamma rays. radiation that is produced with a combination of magnetic and electric forces. It exists as a continuous spectrum of radiation, from that with the highest energy level and shortest wavelength (gamma rays) to that with the lowest energy and longest wavelength (long radio waves). The visible part of the electromagnetic spectrum has a wavelength between 400 and 700 nm. Ultraviolet and infrared radiation have wavelengths just below the short end and above the long end of the visible spectrum, respectively. X-rays have wavelengths from about 0.005 to 10 nm. All forms of electromagnetic radiation travel at the speed of light. Wavelike energy propagated through matter or space; varies widely in wavelength, frequency, photon energy, and properties; may be natural or artificial and includes radiowaves, microwaves, heat waves, visible light, ultraviolet light, x-rays, gamma rays, and cosmic radiation. Wavelike energy propagated through matter or space; varies widely in wavelength, frequency, photon energy, and properties; may be natural or artificial and includes x-rays, gamma rays, and other forms. pertaining to or emanating from electromagnetism. measures the electromagnetic force generated when the blood flowing through a vessel of known diameter passes through a magnetic field at right angles to the magnetic lines of force. transport of energy through space. Examples are x-rays, radio waves. receptors which perceive electromagnetic stimuli. 1. divergence from a common center. 2. a structure made up of diverging elements, especially a tract of the central nervous system made up of diverging fibers. 3. energy carried by waves or a stream of particles. One type is electromagnetic radiation, which consists of wave motion of electric and magnetic fields. The quantum theory is based on the fact that electromagnetic waves consist of discrete particles, called photons, that have an energy inversely proportional to the wavelength of the wave. In order of increasing photon energy and decreasing wavelength, the electromagnetic spectrum is divided into radio waves, infrared light, visible light, ultraviolet light and x-rays. Another type is the radiation emitted by radioactive materials. Alpha particles are high-energy helium-4 nuclei consisting of two protons and two neutrons, which are emitted by radioisotopes of heavy elements, such as uranium. Beta particles are high-energy electrons, which are emitted by radioisotopes of lighter elements. Gamma rays are high-energy photons, which are emitted along with alpha and beta particles and are also emitted alone by metastable radionuclides, such as technetium-99m. Gamma rays have energies in the x-ray region of the spectrum and differ from x-rays only in that they are produced by radioactive decay rather than by x-ray machines. Radiation with enough energy to knock electrons out of atoms and produce ions is called ionizing radiation. This includes alpha and beta particles and x-rays and gamma rays. study of the effects of ionizing radiation on living tissues. particles emitted in nuclear disintegration, including alpha and beta particles, protons, neutrons, positrons and deuterons. special equipment, including Geiger-Müller tubes and a scintillation crystal, is available to detect radiation which may be accidental, or detect small amounts where this is expected but it needs to be measured in terms of accumulated dose. energy, unassociated with matter, that is transmitted through space by means of waves (electromagnetic waves) traveling in all instances at 3 × 1010 cm or 186,284 miles per second, but ranging in length from 1011 cm (electrical waves) to 10−12 cm (cosmic rays) and including radio waves, infrared, visible light and ultraviolet, x-rays and gamma rays. means more than the patient being exposed intentionally to an x-ray beam. Technical persons in the vicinity will also be exposed to a much less dangerous but perniciously cumulative load of radiation. the portion of the spectrum of electromagnetic radiation of wavelengths ranging between 0.75 and 1000 μm. See also infrared. is caused by exposure to radioactive material. High doses cause intense diarrhea and dehydration and extensive skin necrosis. Median doses cause initial anorexia, lethargy and vomiting then normality for several weeks followed by vomiting, nasal discharge, dysentery, recumbency, septicemia and a profound pancytopenia. Death is the most common outcome. Chronic doses cause cataract in a few. Congenital defects occur rarely. 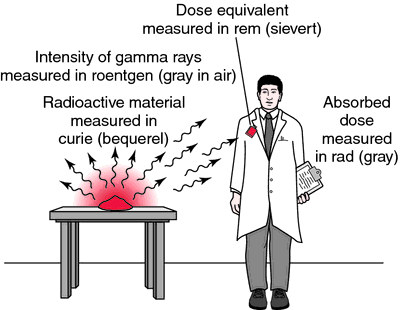 energy emitted by radium or radon inserted directly into the tissue. corpuscular or electromagnetic radiation that is capable of producing ions, directly or indirectly, in its passage through matter. Used in treatment of radiosensitive cancer, in sterilization of animal products and food for experimental use. the person responsible for the administration of radiation therapy including estimating the dose required for a treatment, arranging for the dose to be delivered and making arrangements for safety of the patient and staff, and disposing of any residual radioactive material. Technical aspects of the work include computer estimations, preparation of isodose curves, preparation of wedge and compensating filters, and calibration of teletherapy equipment. radiation emanating from the x-ray tube which is absorbed by the subject or passes on through the subject without any change in photon energy. includes proper control of emissions from the x-ray machines, proper protective clothing for staff, keeping unnecessary people out of the way while the tube is actually generating its beam, the wearing and regular examination of a dosimeter and the proper storage of radioactive materials or residues. fibers extending from the pyramidal tract to the cortex. tissues vary in their sensitivity to the damaging effects of irradiation. The rapidly growing tissues are most susceptible, e.g. the embryo, rapidly growing cancer, gonads, alimentary tract, skin and blood-forming organs. a fiber system joining the thalamus and the hypothalamic region. fibers radiating laterally from the nucleus ruber. fibers streaming out through the lateral surface of the thalamus, through the internal capsule to the cerebral cortex. a person skilled in radiotherapy. See also radiation therapy (below). the portion of the spectrum of electromagnetic radiation of wavelengths ranging between 0.39 and 0.18 μm. See also ultraviolet rays. However, NPs with high surface energy tend to form aggregation in polymer resins, which will affect their activity and selectivity for absorbing EM wave. Note that in (3) above, k is the wavenumber of the incident EM wave (k = 2[pi]f/c, where f is the frequency of the incident EM wave). The electric and magnetic field distribution in the whole multilayer periodic structure is a property of the EM waves interference. Outside the bubble however, the loop has remnant EM waves and behaves as RF antenna marginally. where c--the speed of the EM wave through the vacuum (3 X [10. In such situation, a classical method is to use analogical recorder measurement system that captures the input and output EM waves. 14) Metamaterials, however, display different EM wave propagation properties. 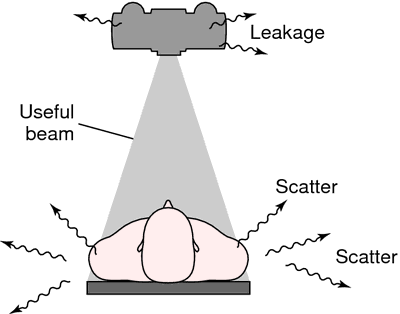 Nuclear weapons feature as one of their attributes the emission of large EM waves, which are particularly devastating when released at high altitudes (Figure 3). The simplest postulate would seem to be that such effects are somehow related to the EM waves emitted by the oscillators in the devices. The EM waves are targeted to bounce back to Earth from "virtual" mirrors and lenses, created by warming specific areas of the ionosphere until they produce a flat or curved shape, capable of strategically redirecting significant amounts of electromagnetic energy. Cray Research is working on a software tool for electromagnetic (EM) simulation and design that will allow users to study how EM waves interact with the surfaces of various objects. 3 Scattering of plane EM waves from an infinitely long cylinder.